Masterton District Council’s water services include drinking water, wastewater and stormwater. We’re committed to managing our water demand to help preserve and enhance our district’s natural environment. Our water usage has a direct impact on our local rivers; the more water we use, the less that is flowing in our rivers. We’ve worked with the Greater Wellington Regional Council to better understand how we can balance our water consumption while preserving the health of our rivers. A key element is limiting the amount of water we use during our driest periods. Over summer there may be some days when you’re asked not to water your garden. When things get a bit dry we need to place priority on water needed for drinking and sanitation – our gardens need to become less of a priority in these times. 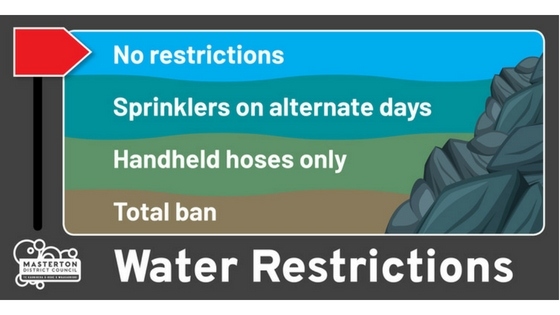 To keep up to date with current restrictions over summer keep coming back to our website, visit our Facebook page, pick up Saturday’s Wairarapa Times Age or listen to the local radio station. 200 litre water tanks are suitable for garden watering and as an emergency water supply. These are available either in green or bone colour from the Masterton District Council office – 161 Queen Street. Cost is $105 per tank and they measure 1100x600mm. The Masterton District Council has been working with the Greater Wellington Regional Council to understand Masterton’s flood hazard in an infrequent and significant flood. Read more about Masterton’s flood hazard. We all need to play our part in conserving water. To explore ways to save water around your home check out the Smarter Homes website or download our water conservation guide (PDF, 891KB). Reduce your shower time to four minutes or less. Use the half flush on your toilet. Wash your car with a bucket of water on the lawn and you’ll water your lawn at the same time.